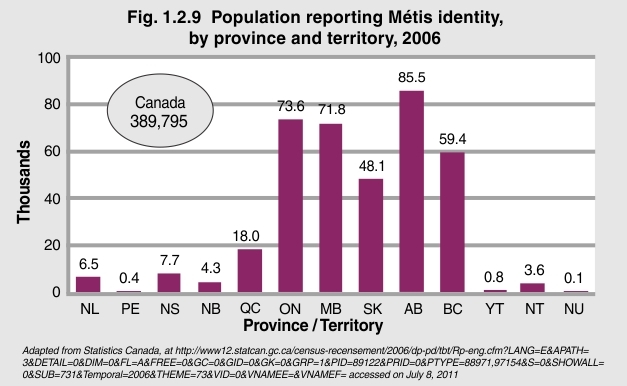 In 2006, the largest populations of Métis and First Nations Canadians resided in the provinces west of Québec. Ontario is home to 158,900 First Nations and 73,600 Métis. BC has the next largest population with 129,600 First Nations and 59,400 Métis, followed by Manitoba (100,600 First Nations and 71,800 Métis), Alberta (97,300 First Nations and 85,500 Métis), Saskatchewan (91,400 First Nations and 48,100 Métis) and Québec (65,100 First Nations and 18,000 Métis). Approximately 15,200 First Nations and 7,700 Métis reside in Nova Scotia, which is more than in any of the other Atlantic provinces. Among the territories, the Northwest Territories is home to largest population of First Nations (12,600) and Métis (3,600), followed by the Yukon (6,300 First Nations and 800 Métis). Fewer than 1,000 First Nations or Métis reside in Nunavut.